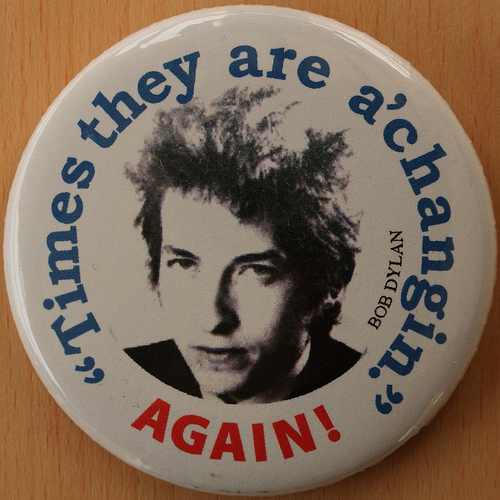 Just as the title of the great song by Bob Dylan implies, “times they are a-changin.” Change is occurring in education. Not only education, but in everything. But wait, haven’t thing always been changing. My answer to this is a definite yes. I look at all the changes that have occurred in my parent’s life and I cannot believe the amount of change they have seen. My father was born into a sod house, my mother had all her teeth removed at a young age because of minor dental problems, my father’s first job in the “big city” of Saskatoon was driving a horse pulled bread cart, and my parent’s first house in Saskatoon had no running water and an out-house in the backyard. For Christmas my siblings and I bought my parents a big, flat screen TV. Time has sure changed for my parents. Maybe not as dramatic, but change has occurred for me. As I reflect, change has always been part of my teaching career. In my first few months of teaching I found myself as the Acting Principal of a K to 12 school. In my first year of teaching I experienced the death of a student and I literally taught 20+ subjects. After one year of teaching I moved divisions and taught junior high students in a temporary location (a truck bay). Once a new school was ready, I taught those junior high students in a very oddly shaped staff room. With overcrowding, the next year I taught students in the gym. My classroom was the corner of a gym with three other teachers occupying the other corners. Over the past two decades I have had the pleasure of teaching students. The educational environments and contexts have been a changing variable for me, most recently the infusion of technology into the classroom, the acceptance of the digital learner, and the focus of inclusion in teaching all students. Since change has always existed for me, sometimes I get confused by why so many people seem to fear change. I am not a supporter of change for the sake of change, but I strongly disagree with the status quo because of TTWWADI (That’s the way we’ve always done it.) Recently a peer of mine, Greg Miller, wrote a blog entitled Change in 2013. In it, Greg identifies some theories of change, but stresses that his role as a Principal is to support change. To build a culture that supports change. I totally agree with Greg on this point. As an educational leader, my role is to build this culture. I must support staff in their own journey of change. Get Out of the Way – do not become the barrier, do not say “Yes, but…”. The times they are a-changin’, they always have and always will. Let us support each other and enjoy the times.